/ Modified aug 31, 2017 10:01 p.m.
As of Aug. 24th, more than 400,000 acres of Arizona had burned this year. That is the largest area burned since 2011, when the Wallow Fire scorched more than half a million acres alone. VIEW LARGER A firefighter battles the Wallow Fire. From June 9, 2011. To one fire ecologist, things could have been much worse. While this season may have been above average when compared to recent years, it has paled in comparison to the ongoing fire issues in the Pacific Northwest and Canada. “Down here, it's a little more moderated,” he said. Falk said Arizona has been waiting for a big fire season for years, and the weather from this winter and early spring created more fuel for wildfire. Abundant grasses helped fuel wildfires this season. Years of lesser acreage can add up, and result in higher fire potential. Falk, who also holds a joint appointment at the UA Laboratory for Tree-Ring Research, said tree-ring data suggest most areas burned every few years to get rid of debris. This year was not lacking in those hot, dry conditions. Tucson recorded the highest average temperature ever for the month of June. Falk said computer modeling done by his department shows wildfire could become an increasing problem if certain conditions persist. “There are many climate futures that are possible depending on how well we regulate or emissions of carbon dioxide and other greenhouse gases,” he said. The ultimate indicator, according to Falk's research, could be what goes on with temperatures. Looking through a window of a truck at a firefighter watching the Burro Fire. 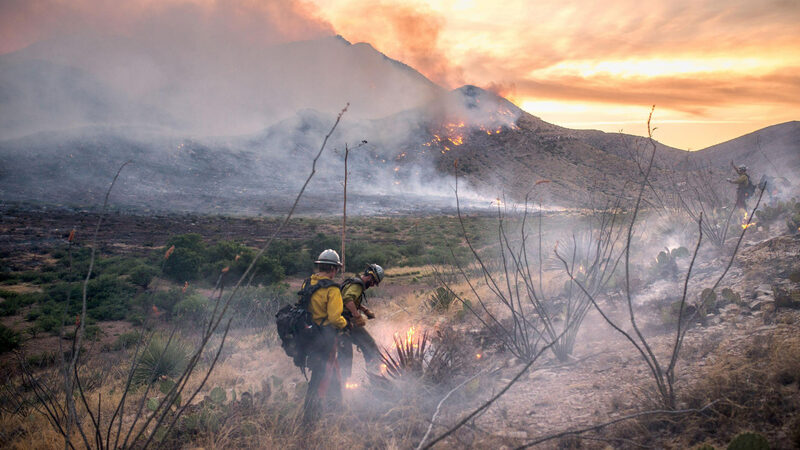 The Burro Fire burned over 27,000 acres east of Tucson in the Santa Catalina Mountains. 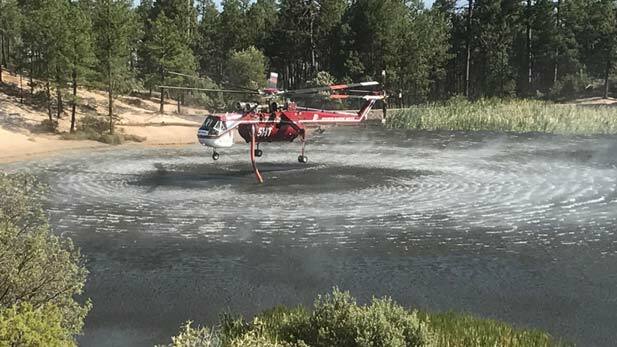 The fire was initially spotted on a Friday, and by the weekend residents of the community of Summerhaven were given an evacuation notice for early Monday morning. Most of the community members left, but a handful who could help fight the Burro Fire stayed. Among them was the head of the Mount Lemmon Water District, Michael Stanley. “I've been here many years, and as soon as I saw the smoke, I said, ‘We're in trouble,’” he recalled about the first time he saw the Burro Fire. The fire started miles away, near Redington Pass, but concerned residents asked the type I incident management team for a briefing. They gathered at the nearby firehouse on the Sunday evening that weekend, and within hours of the meeting, they were told they needed to leave the mountain at 5:30 a.m. Monday. “The Forest Service was concerned that if the fire was there, we might have too much smoke to be able to escape,” said Stanley. There was also concern about keeping the lone paved road into the community clear. The incident management team planned to use it as a fire break to prevent Burro from traveling further up the mountain. As the fire approached the road, Stanley said he started to worry. The Bullock Fire burned 30,000 acres and nearly entered the community 15 years ago. When talking about Burro, many residents mentioned Bullock and the fire that came one year later. 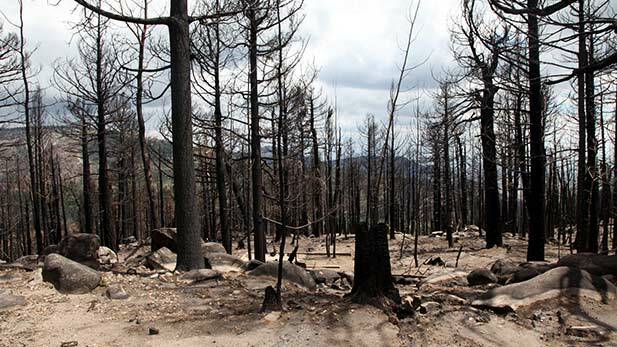 The Aspen Fire burned nearly 85,000 acres in 2003. After it rolled through Summerhaven, only about 100 buildings were still standing. Stanley's home was among those that burned in Aspen. Davis' home shared a driveway with his neighbor, and the difference between what happened to the two homes shows how random he thinks fire can hit. “When we first came back up, we could see that the neighbors’ cabin was burned,” he said. His home was not visible from the road, so he had to get up the driveway a bit before he could see it. 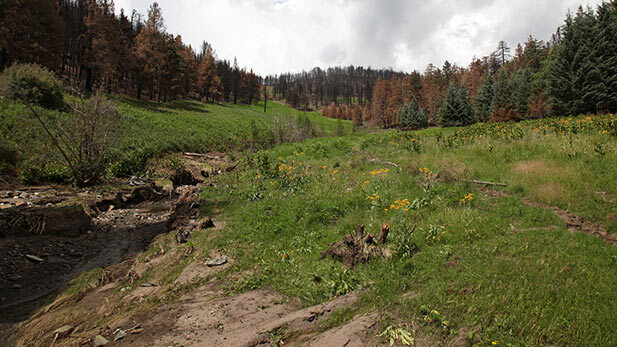 The Mount Lemmon Water District lost much of its equipment, and the damage was not minor. Stanley's office today is a reminder of the damage done to the community. 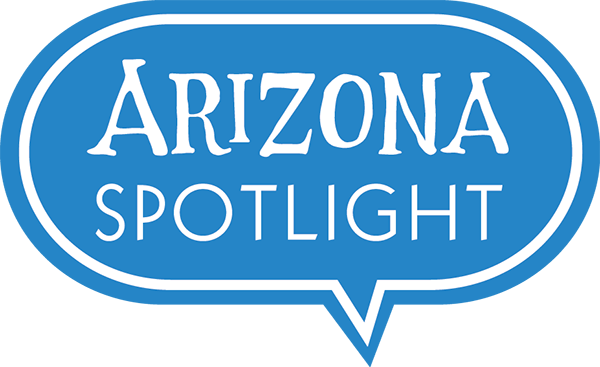 Mount Lemmon Water District is in a building that used to be a single-room schoolhouse. A playground that was installed not long before Aspen is still out back, barely touched for 14 years. The basketball hoop has concrete water meter boxes stacked underneath it. 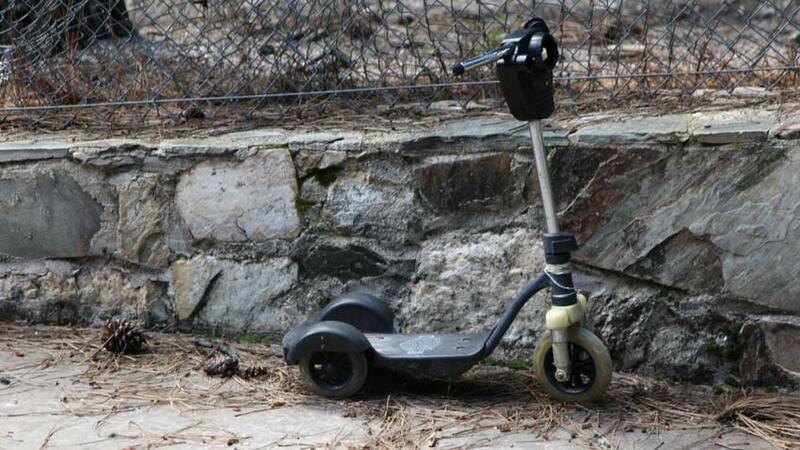 VIEW LARGER A children's scooter, burned by the fire. Stanley moved into the space a few years after Aspen. The inside appeared to be frozen in time. All but one of the families with children in the school lost their home. A playground that was installed not long before Aspen is still out back, barely touched for 14 years. More than houses were lost too. Most of the businesses in town burned. Mount Lemmon Water went from 425 customers down to 115, according to Stanley. But today, the number of water customers carries some hope. It has gone back up to 300. The rebuild is happening, but slower than Stanley expected. Stanley is one of those who took longer to rebuild than anticipated. He and his wife, Carol Niehoff, finished rebuilding their home recently. The house sits on the north face of the mountain. The Superstition Mountains are visible from their back porch on a clear day. The plot was formerly owned by an elderly woman who decided to sell and move to Tucson after the Aspen Fire. Niehoff said the close call of the Bullock Fire may have made the community complacent for Aspen a year later. The loss of homes, Niehoff said, seems to have united the community. That new-found sense of community has Stanley and Niehoff preparing their home today. They are throwing a party this weekend, doing an activity that has become a part of the culture. Jeanne Mayer is helping with the setup. She moved to Summerhaven 21 years ago to take a job as a firefighter, and has lived there ever since. Mayer is planning her own event, with the hopes of getting people together and making the community more fire-wise. Stanley and Niehoff would like to see the community increase its fire safety, because evacuations can be a strain on their relationship. They try to stay in touch as much as possible during times when she evacuates, but he stays. Those conversations can be tense, though. “You know you go, ‘Well the smoke alarms went off today,’ and she says, ‘Are you safe?’” said Stanley. He said the community has changed, regrowing at a slow and steady pace, like the forest around it. The community has changed, regrowing at a slow and steady pace, like the forest around it. 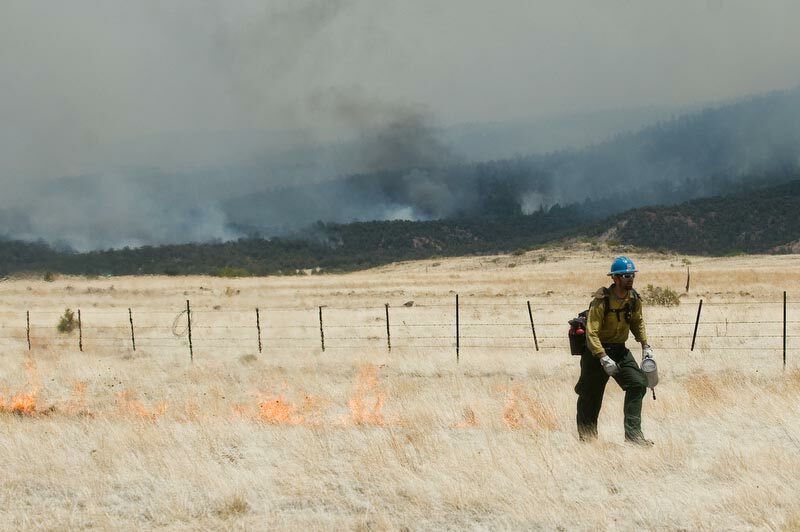 It was an active fire season in the grasslands of Southern Arizona. 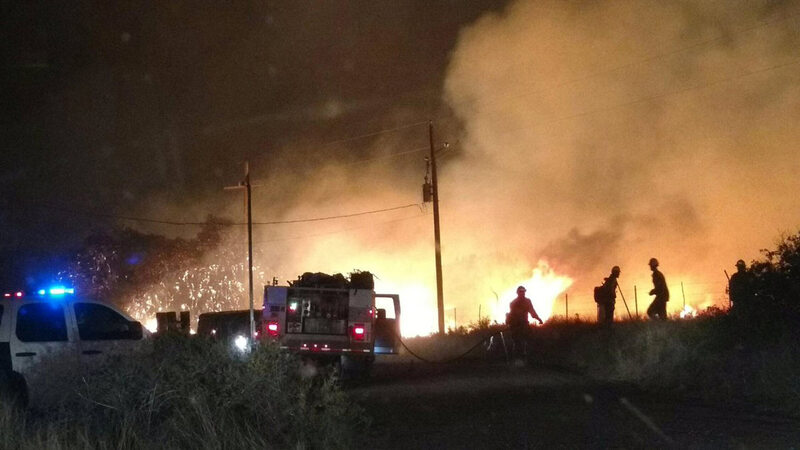 The area around Sonoita saw numerous fires, some of which made their way into the community of 1,000 people. Responding to fires in the area is the job of the Sonoita-Elgin Fire District. The district has 46 volunteer firefighters and 13 staffers. DeWolf said he had 58 fires in his district this spring and summer, ranging from the Sawmill Fire at 47,000 acres to small spot fires. The Sawmill Fire grew into the Sonoita area, having started in the Santa Rita Mountains west of the community on a Sunday night. As the fire grew, Sonoita-Elgin crews became a part of the responding forces on Monday. “We spent the next 48 hours bumping fire around [the community] as well as, once the fire had gone through, going up and cleaning up after it,” he said. The district spans 350 square miles and two counties. The logistics of evacuating the area can be challenging. He said the district relies on the standard procedure of using sheriffs when possible, but it often sends people from a variety of groups including the Border Patrol, Bureau of Land Management and the Forest Service. While large swathes of land burned in the spring and early summer, it can be hard to tell exactly where fires hit today. “We burned a lot of grassland this year. However, as you see, it's all back again,” he said. The quick-growing nature of the Sonoita area's ecosystem means staying fire-wise is an extensive effort. 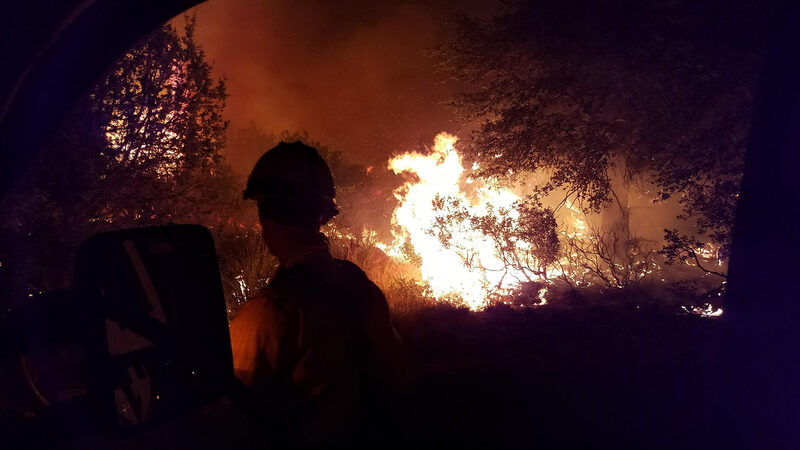 Fire season is over in Sonoita, for the most part, which means DeWolf's crews are now spread across the U.S. returning favors paid by other fire departments during the season. A wet start to the monsoon brought an end to the busiest part of Arizona's fire season. Now, some turn their attention to the aftermath. Fire can show beneficial effects on an ecosystem within weeks, but in places where a burn was severe, that may not be the case. Burn area emergency response (BAER) often comes into play in severely burnt areas. One such example from this season is the scene of the Frye Fire. The fire burned nearly 50,000 acres burned in the Pinaleño Mountains, 2,000 acres of which were declared severely burned. Crews are now taking efforts to restore travel on the mountain and ensure severely burned areas do not lose all of their soil due to a lack of ground coverage. The efforts to slow soil erosion begin at nearby Safford Regional Airport. There, a single-engine plane is being loaded with the contents of 5-foot tall white bags. McAlister was a part of the incident management team that oversaw efforts on the Frye Fire. He has stayed in Safford as a part of the team managing BAER efforts. The barley is weed-free and sterile. It will sprout within days of aerial seeding and hold the soil for one lifespan, buying time for native plants to spread their seed into the area. 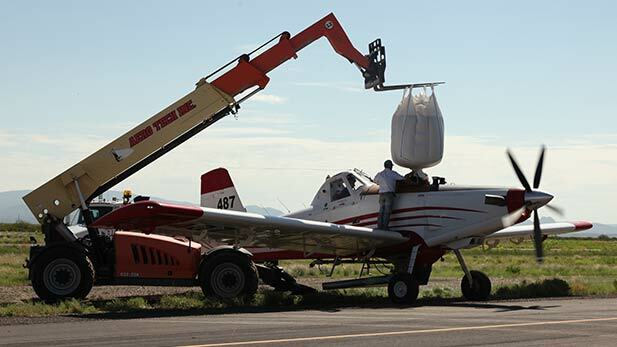 After being loaded with more than a half-ton of seed, the plane takes off for the mountains. Its load will be mostly concentrated on the tops of the peaks and other areas that have been severely burned. Three large storms have brought rain to the Pinaleños in recent weeks. The fire killed plants that would normally hold soil in place, so the soil was pushed along into waterways. Along with it came debris, ranging from small twigs to boulders. The debris has clogged man-made crossings in places such as Wet Canyon. Debris clogged the bridge's culverts, and water is now running over its top. The CCC bridge has been out of use since a modern, two-lane bridge was built less than 20 feet downstream. Construction crews are removing the old stonework bridge one boulder at a time. It is no longer in use and represents a danger to the modern bridge. By the time crews are done, the storms will have cost the popular recreation site most of its historical landmarks, but two small plaques will remain. “They were mounted on this wall, and talked about the construction of the bridge and era in which it was constructed, and amazingly enough we found those plaques intact,” he said. A little ways up the road from Wet Canyon is the first of the severely burned areas on the road. This was the pilot's first target, and barley seed has been spread on the road and the steep mountainside. 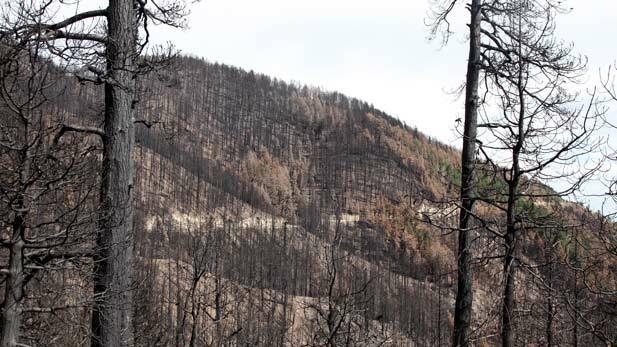 The slope is steep, and the area is filled with charred trees and scorched bedrock. The soil rolled downhill in storms, creating part of the problem for the next waterway on the road. Grant Creek is the historic water source for a military fort turned state prison that dates to the Civil War era. The Army abandoned the site at the turn of the 20th century, and it became a state prison in 1973. It switched to well water during the modernization. An inmate crew from the prison helped fight the Frye Fire and rebuild some of the roads on Mount Graham. A non-inmate construction crew is hard at work this day, clearing the culverts that go under the road here. “I had an individual up here two weekends ago, and he was saying, ‘So what’s the plink, plink?’ And it was the road washing away one rock at a time, hitting the culvert,” said McAlister. He added that one more storm would have probably led to the destruction of the road. 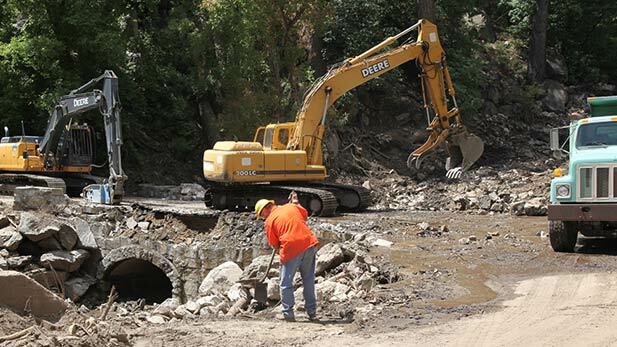 The road continues on, more crews work to improve water drainage and washed out areas, and ends at Webb Peak. The top of the mountains were severely burned, leading to many of the issues downhill. 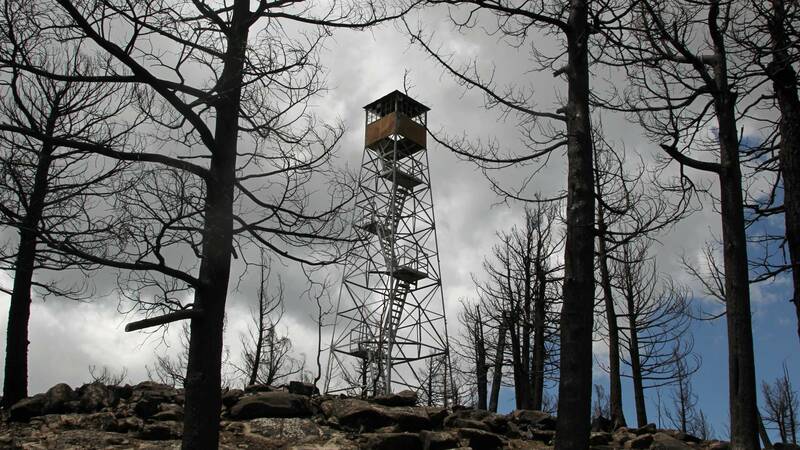 At the highest point of the peak is a fire lookout tower, also built by the CCC. Fire-spotting tools sit under the tower, charred and twisted by the heat. An aerial drop of barley seed will help slow the problem, but the area will not look like a re-established forest for close to a century, McAlister said. Lower down on the mountain is Peter's flat, an area named after a Scottish-born logger who managed potato patches in a few of the mountain's meadows. Trees on the edges of the meadow are burned, but the field itself has already started to re-establish. “The ferns coming in and the dead trees up there. This area will be pretty stable, and there will be some surviving trees on both sides of the drainage,” he said. The stream that runs through Peter's flat has cut down to bedrock since the fire, leaving larger-than-normal banks on either side. “This will recover. The banks will fold in, and it’ll heal itself,” said McAlister. The mountain has already started to reclaim charred land, just like it has in the scars of countless other fires before.